The team at StreetSmart believe no one should be without a safe and secure place to call home. We are expert in engaging the community, raising funds and getting help to where it is needed most to combat homelessness. We are now looking to partner with like-minded philanthropists, trusts, foundations and corporates to co-fund our community grants to smaller, grassroots homeless services across Australia and accelerate our impact in the community. Through a partnership with StreetSmart we can help you effectively target and tackle homelessness and domestic violence across local communities. Our new funding partnership will also provide an element of sustainability and capacity building to enable StreetSmart to continue to grow our community engagement, fundraising and impact. 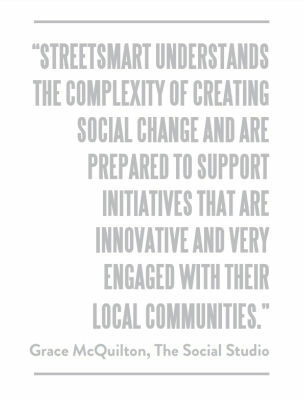 StreetSmart will be developing partner engagement opportunities to share learning and sector knowledge. Currently community grants are distributed twice a year, November and May. If you’re interested, let’s talk. We want to make things happen and are keen to hear from you.